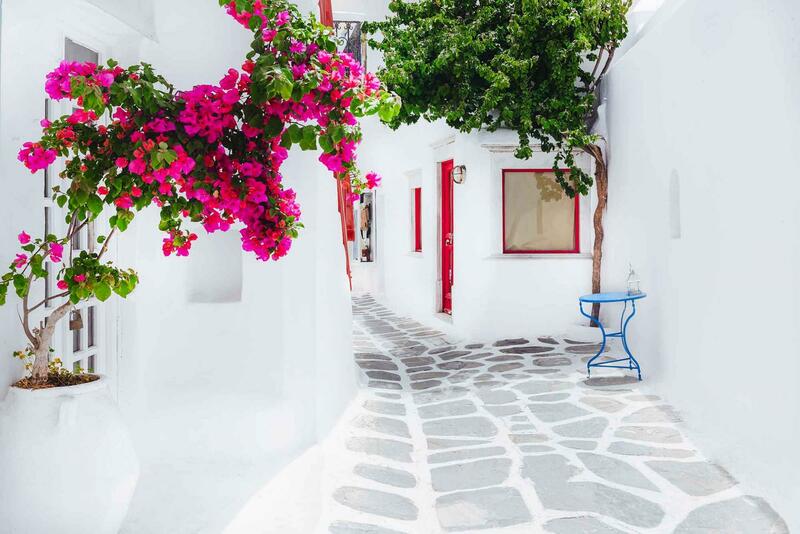 The whitewashed, Cycladic island of Mykonos is the glamour capital of Greece, popular for its sugar-cube buildings, beachfront parties and carefree mystique. While it draws comparisons to Ibiza and Côte d'Azur for its piercing turquoise skies and sizzling hot beach clubs, there is nowhere else in the world quite like this chic Greek ‘island of the winds’. Mykonos was made famous in the sixties when photographs surfaced of a head-scarfed Grace Kelly arriving on the island in 1961. Mick Jagger and Mia Farrow followed in quick succession and it soon became an haute hippie destination for artists, actors and the international jet-set, as well a liberal mecca for gay entertainment. Today it heaves with honeymooners, hedonists of all ages and a phalanx of celebrities. 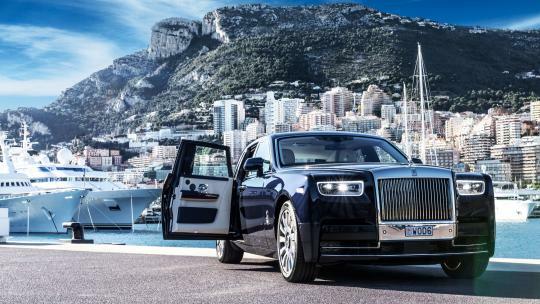 Oligarchs and A-listers pack their superyachts in the harbour while the likes of Tom Hanks and jeweller David Morris own villas perched on rocky hillsides. Clusters of Kardashians are photographed frolicking on the island’s golden beaches each summer and this year, Lindsay Lohan lent her name to a beach club. Mykonos is a town that never sleeps and when the sun goes down, the music goes up at open-air clubs and round-the-clock restaurants, while houses on the hillside light up like a string of fairy lights. 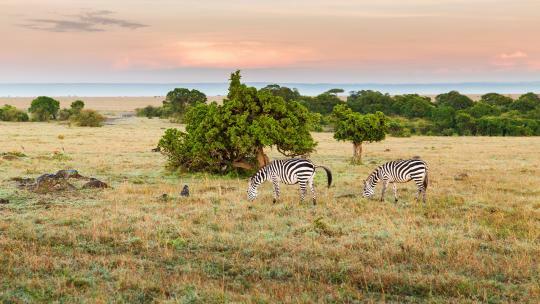 However, the glamour and nightlife is only a small slither of this island’s charm. 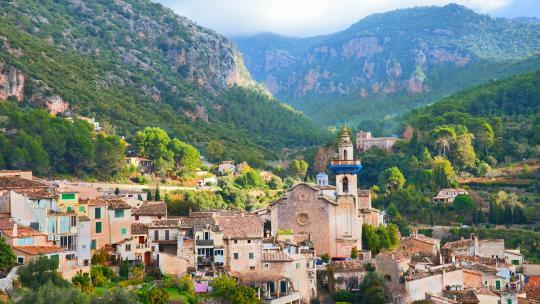 The Instagram-famous, main town, Chora, is a chalky white labyrinth of cubic buildings; twisting, cobblestone streets and Byzantine chapels, dripping in pretty bougainvillea. 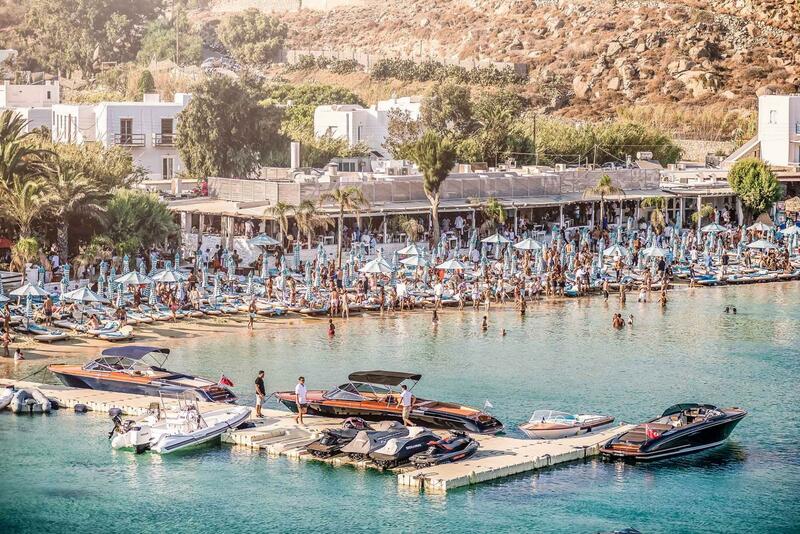 There are only 30 taxis on the island meaning that most visitors rent a car or moped, or make use of the regular buses, which shuttle partygoers to beach clubs localised on the outskirts of the island. Whether you go to Mykonos for the glittering sand and oceanfront cocktails; for the luxury hotels and private infinity pools; the rosé-fuelled long lunches or all-night-long parties, you’ll find a rhythm to suit your groove. 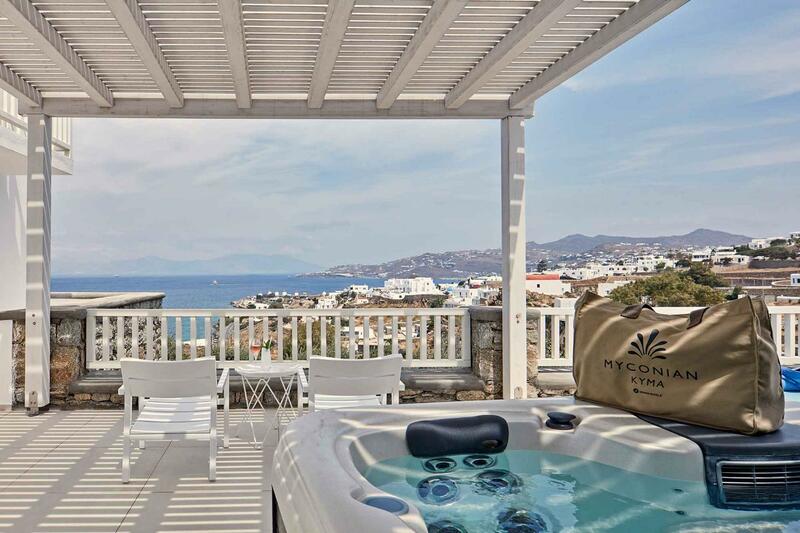 Mykonos is refreshingly absent of global hotel chains and instead offers home-grown boutique boltholes. The family-run Myconian Collection Hotels & Resorts group is responsible for nine leading luxury hotels on the island. 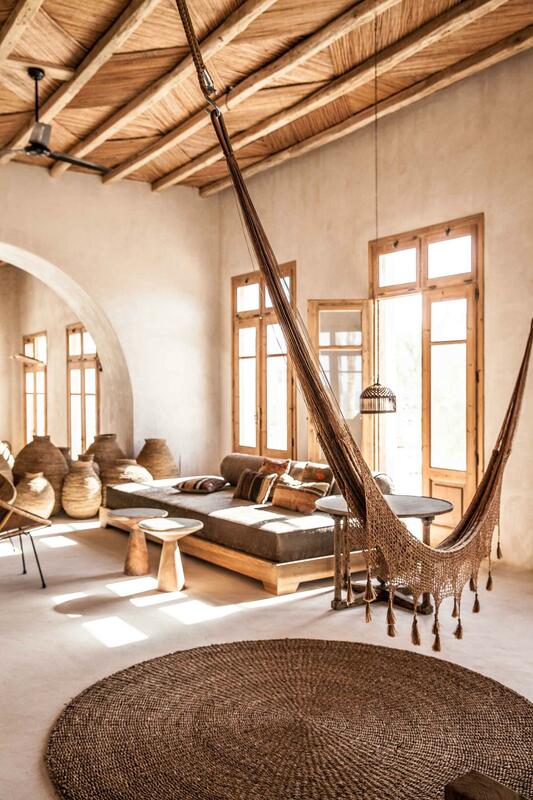 The latest addition to this cool conglomerate is Myconian Kyma, one of the group's Design Hotels. It is perfectly positioned within walking distance of the town, but far enough away to ensure peace and quiet when needed. The clue is in the name of this Design Hotel, curated by Galal Mahmoud. 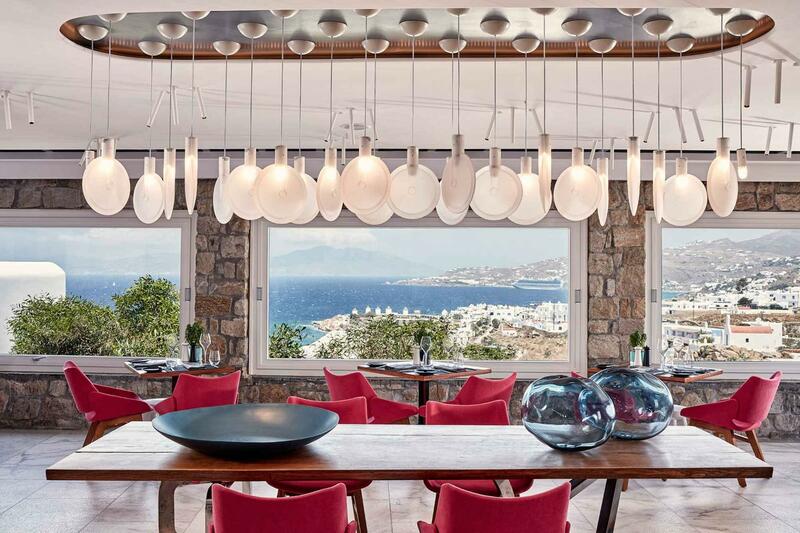 Traditional Cycladic architecture is enlivened by contemporary artwork, sculptural chandeliers, bespoke ceramics and colourful, retro furnishings. 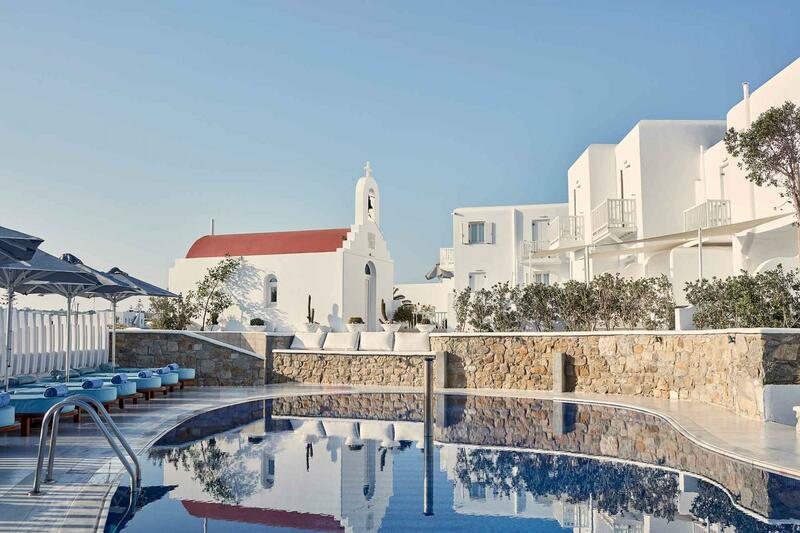 Sea-facing, light-filled rooms offer panoramic views over Mykonos, while the hotel pool is perfect for sybaritic lounging during the day, often accompanied by laidback live music. Upgrade to a Horizon suite for a private pool, basking in sunshine. In the Noa Oyster Bar & Grill restaurant, hot pink furnishings and wall-to-wall sea views provide a serene and stylish backdrop for breakfast, which is an extensive and vibrant bounty of cold meats, fruit, Greek delicacies and cooked options. In the evening, grilled steak and seafood spearhead the dinner menu, cooked with flair and expertise. Myconian Kyma is next door to sister hotel, Korali & Naia and guests can use the facilities in either hotel. Both share an adults-only spa with a quintet of indoor therapy pools, in addition to a generous treatment menu. Historically, Greece is not known for its food or wine. 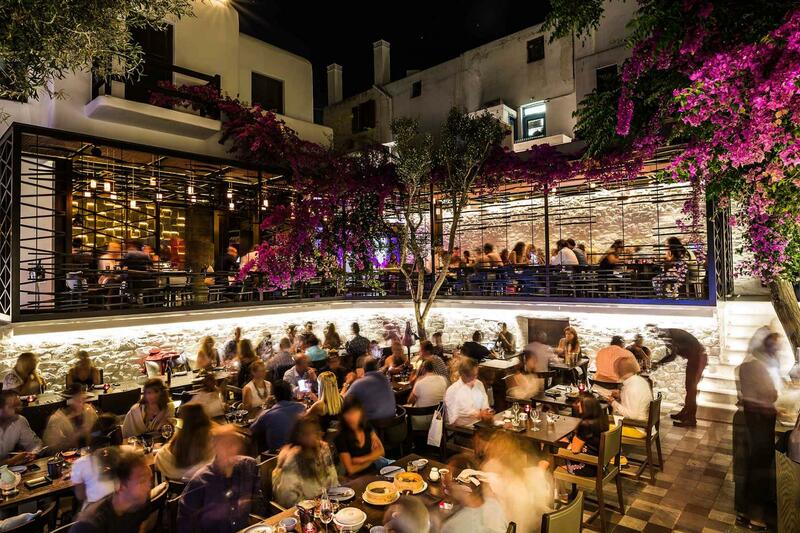 In recent years however, Mykonos has welcomed a diverse dining scene that now rivals any of its European counterparts. Relaxed restaurants are dotted all along the harbour serving freshly caught seafood, while calamari at Kiki’s Tavern is worth the queue for a table. 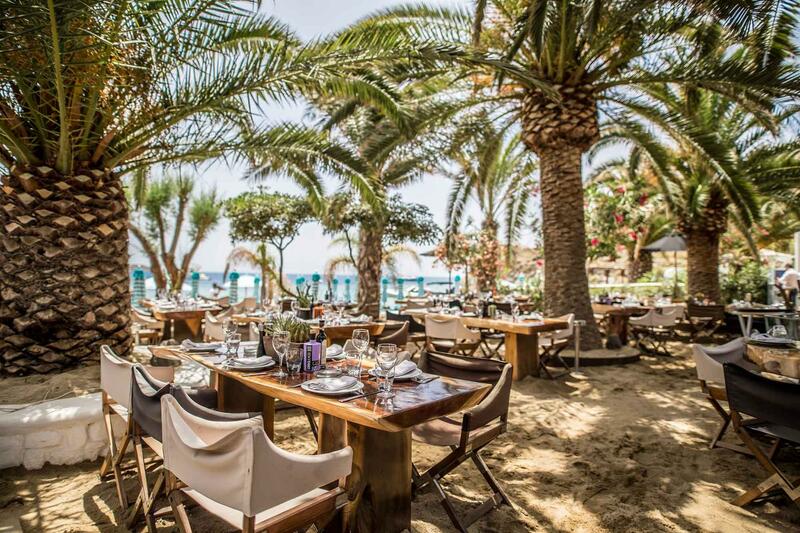 Dine under an overhanging canopy of bougainvillea at Avra, which strikes the balance between buzz and romance; watch the sun set at Remezzo or venture to the regaled Hippie Fish, adjoined to the relaxed and beautiful Agios Ioannis beach. London’s Hakkasan has an offshoot in the heart of the old town coined Ling Ling Mykonos, serving Cantonese fine dining in a glittering open-air courtyard. There are 25 sweeping sandy beaches across Mykonos, from the secluded shores of Agios Sostis to the pleasure-seeking Paradise and, even greater, Super Paradise. 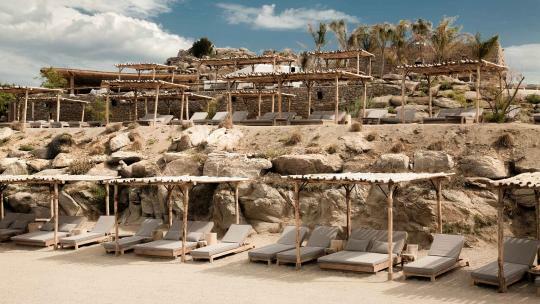 No trip to Mykonos is complete without a trip to Scorpios, so-called after the private Greek island owned by Aristotle Onassis and playfully referred to by holidaymakers as Soho House on the beach. Head here in the afternoon for a laidback lunch overlooking crashing waves before lolling on hammocks and driftwood beds, or unwinding in a yoga workshop. In the evening, DJs takeover as the sun falls and a Med-meets-Burning Man vibe takes hold. 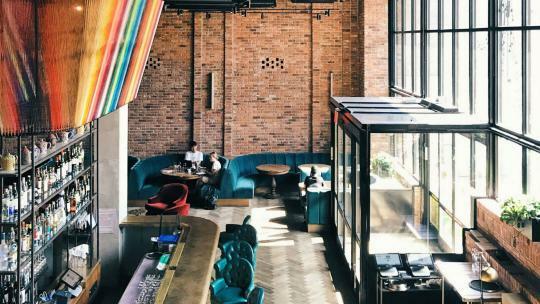 The likes of Emily Ratajkowski, the Hadid sisters and Lewis Hamilton have been spotted at Nammos, a magnum-fuelled playground where lunch can cost more than your hotel room. This summer, it expanded by opening Nammos Village, an upscale shopping village within bottle-popping distance of the beachside restaurant.